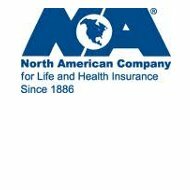 This Health Insurance Company Review of North America will discuss the insurance company better known as North American Company for Life and Health Insurance. The company began in 1886 as the North American Accident Association. The insurance company is based out of Chicago, Illinois, but has offices around the country. Although the company has Health Insurance in their title, the company does not actually offer health insurance. If you would like to receive and compare health insurance quotes for other companies in your local area, just fill in your zip code in the space provided below. Principal Office toll free phone number: 1-877-586-0240. The main insurance product that North American Company sells is life insurance. The purpose of life insurance is to help cover household bills, the mortgage, and other everyday expenses in the unfortunate event of a tragedy. Depending on the amount of life insurance you purchase, the death benefit received may not only help the immediate financial needs of a family but also help with finance needs in the future such as retirement funds supplementation and college tuition. Life insurance is not just for people with children or dependents. It is a good idea to have for anyone whose loved ones would be negatively affected financially by your death. The death benefit may be used for funeral expenses or debt payments. There are two types of life insurance, term, and permanent. Term insurance is more affordable and is good for needs that are not permanent, such as college tuition. Term insurance covers you for a particular amount of time and is the best choice for low cost coverage during your peak earning years. Permanent life insurance is meant to provide financial protection that is lifelong. Permanent coverage includes a wide range of products, some of which have a cash value such as universal life insurance. Permanent life insurance is a good idea if your needs for coverage are more long term. The policies are priced and designed to keep for a long period of time. The product offered by North American Company for term life insurance is ADDvantage Term. This provides protection for a period of time and has guaranteed level premiums. It is a great product to start with and it can change as your needs do. You can choose a premium period from four different periods of time; 10, 15, 20, or 30 years. With ADDvantage, you can also add endorsements or riders to design your policy. You also have the option of being able to switch your coverage to a permanent insurance policy. North American Company offers four different products for Universal life insurance, which is considered permanent insurance. The Custom Accumulator provides protection for death benefits and allows you to build up cash value over time to use later in life. Custom GrowthCV is a product in which you get bonuses to help build up cash values. Custom Guarantee is a product that guarantees death benefit protection up to age 120. Custom TermGUL is a low cost option for death benefit protection that is available on a guaranteed basis or a current basis. For Indexed Universal life insurance, North American Company offers the Builder IUL and Guarantee Builder IUL, which builds cash value for retirement income. They allow the policy to earn interest based on stock market index movement. The Rapid Builder IUL is a fast way to build up cash value and the Survivorship GIUL insures two individuals. If you are looking for health insurance, you can fill in your zip code below and be able to compare health insurance rates for a number of different companies.